Our physicians believe the following guidelines set forth by the U.S. Postal Service represent a fair estimation of allowable job related stress during pregnancy. 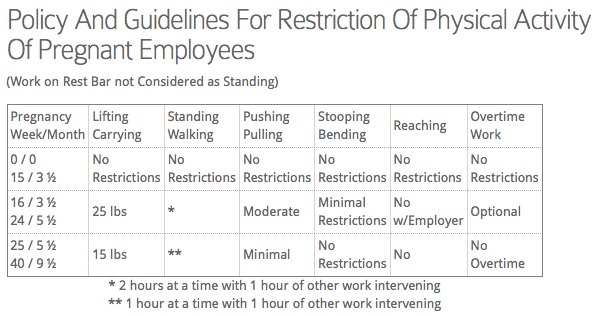 If work limits cannot be kept within these guidelines, we feel there is a significant chance that abnormal stress and discomfort to the pregnant patient may occur. Off duty on Maternity Leave. Return to duty 6 weeks after date of delivery. Employees with arduous duties (Motor Vehicle Operators) reassigned at beginning of 4th month and given inside work, if available, commensurate with the above restrictions. 2. Work commensurate with above restrictions not available. 3. Medical certification that employee is not able to work within the above restrictions.